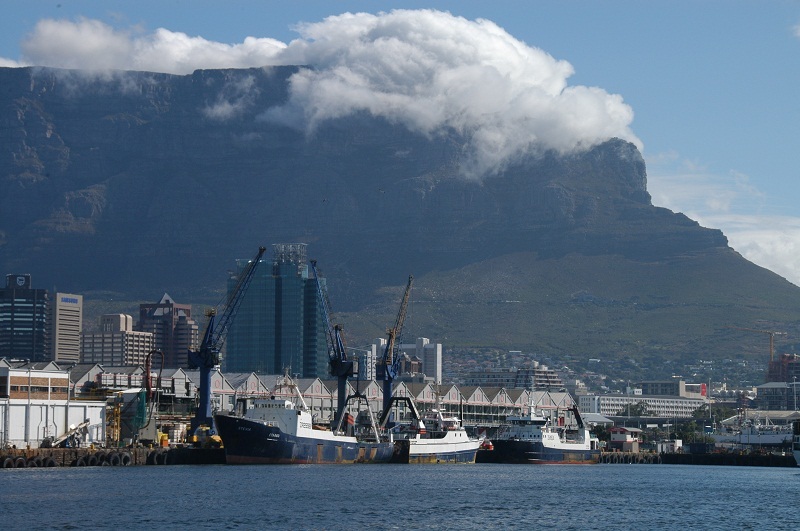 It was Sir Francis Drake, who wrote in his journal “This cape is the most stately thing and the fairest cape we saw in the whole circumference of the earth”, on seeing the Cape for the first time. 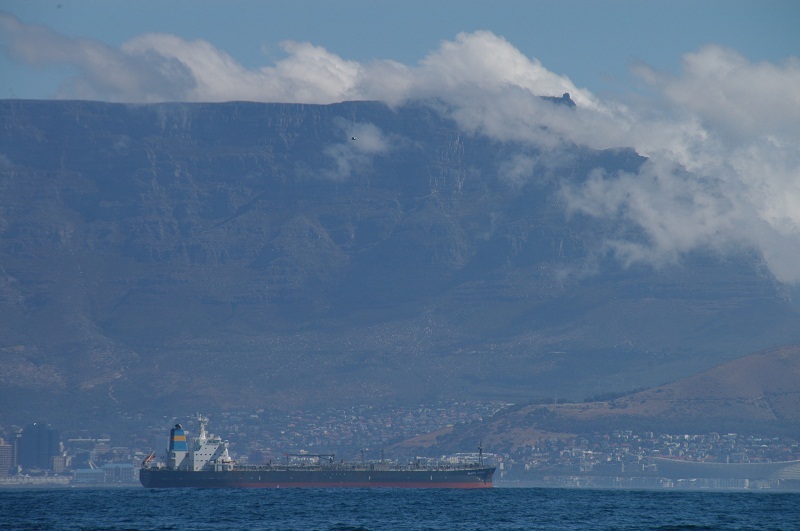 It’s an apt description and one that I believe he would have made having viewed the Mother City of South Africa, as it has become known, from the vantage point of a sailing vessel out at sea off Table Bay Harbour, a view that offers a full perspective of the majestic Table Mountain, which, on November 11, 2011, was named among the New7Wonders of Nature. 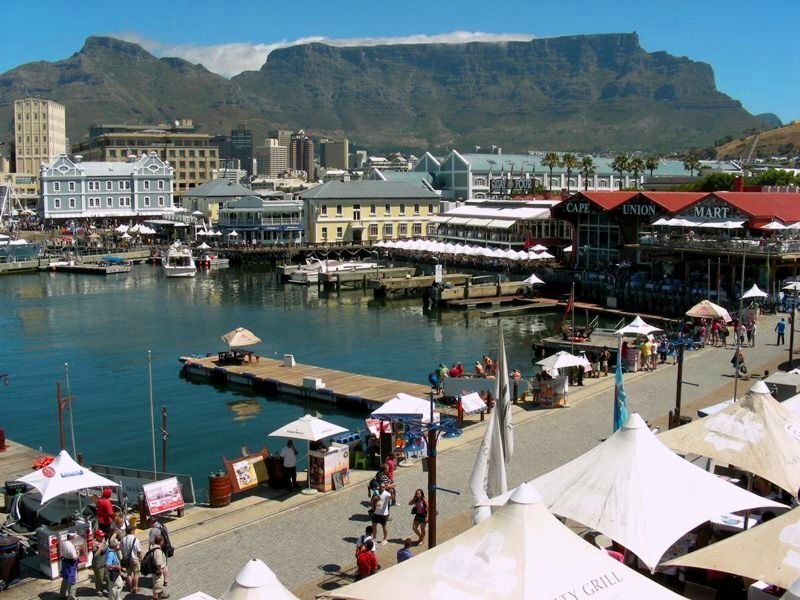 In October 2011, at the International Design Alliance (IDA) Congress, the city itself was designated World Design Capital 2014. 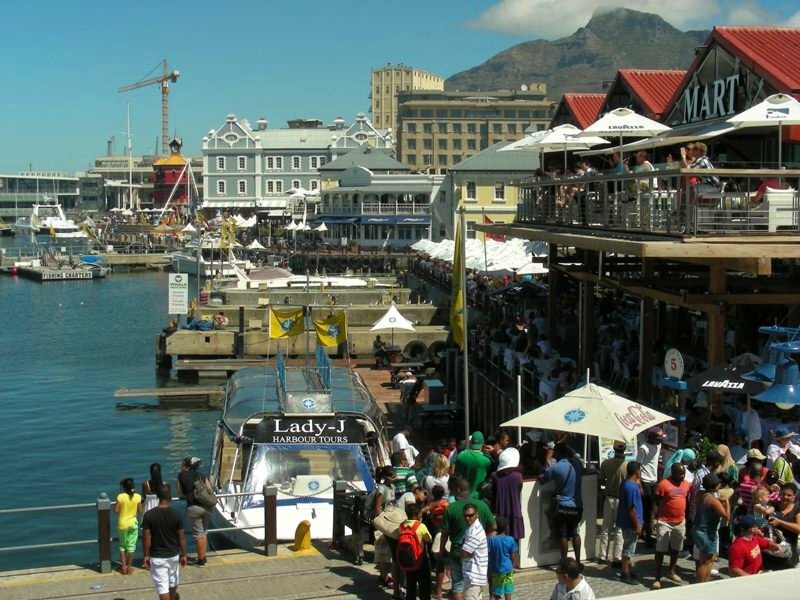 Further accolades have followed, with Cape Town more recently being selected by The New York Times as No 1 of 52 Places To Go in 2014. 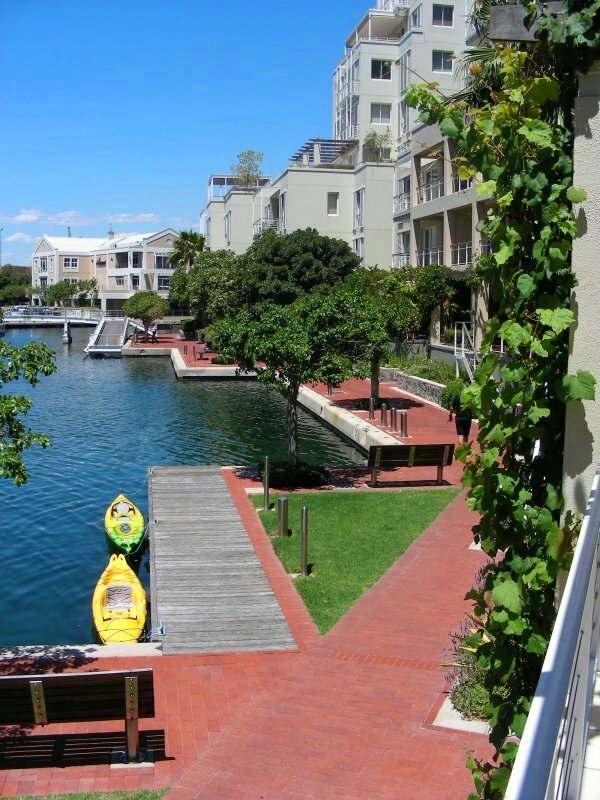 These recognitions aside, Cape Town remains the city of my birth and one I still call home. 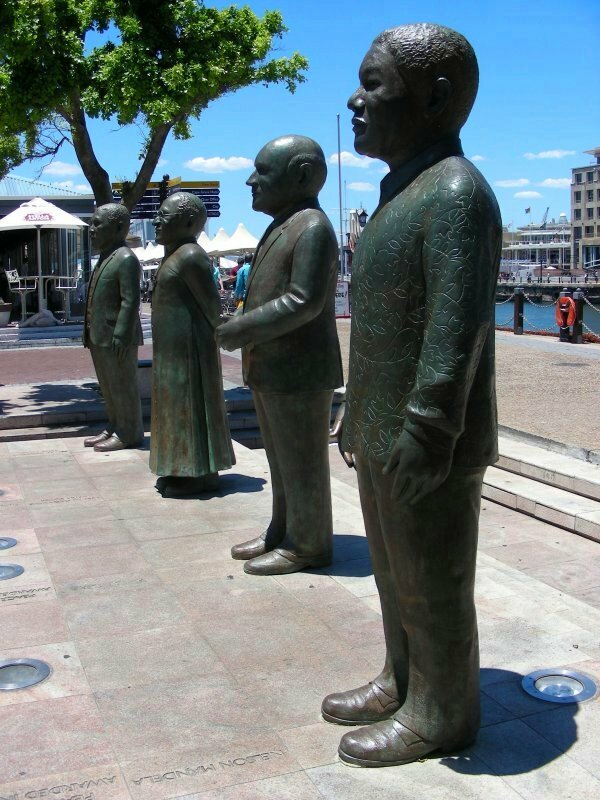 Statues of South Africa’s four Nobel Peace prize laureates – Tutu, de Klerk, Luthuli & Mandela at V&A Waterfront. 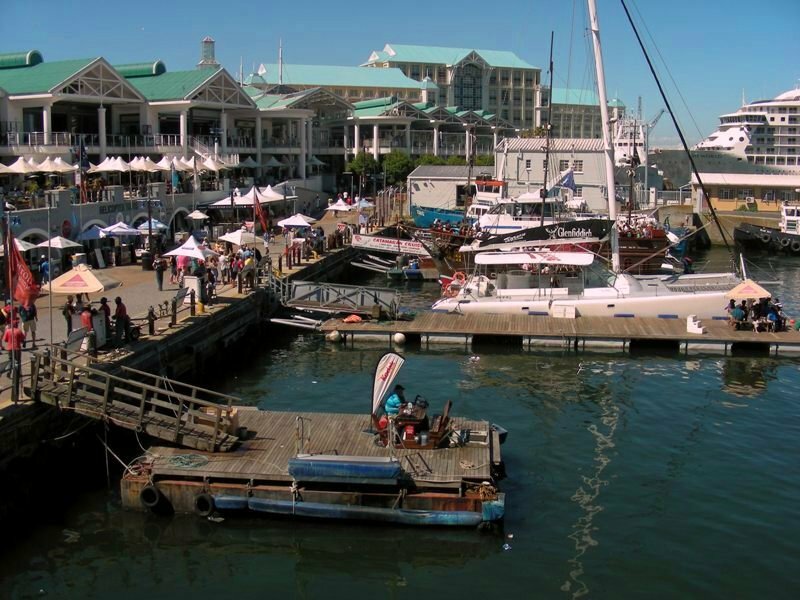 Cape Town’s V&A Waterfront serves as both a working harbour and tourist attraction. 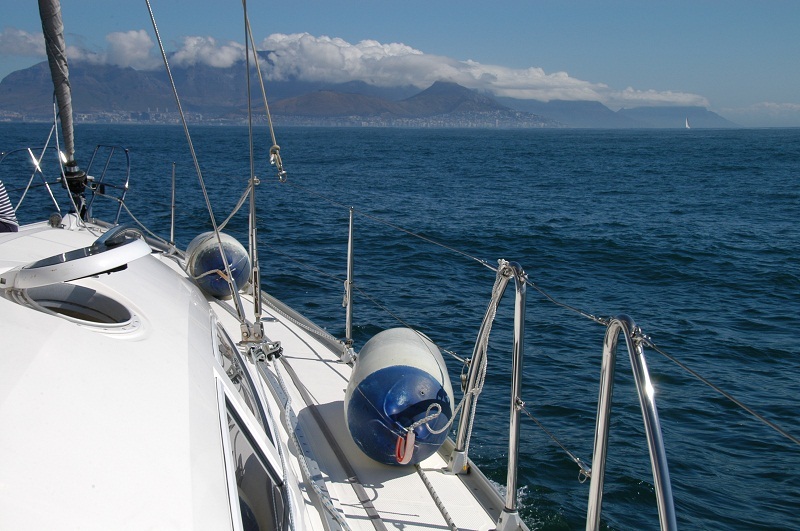 There is probably no better way to view Table Mountain than aboard a yacht in the waters of Table Bay. 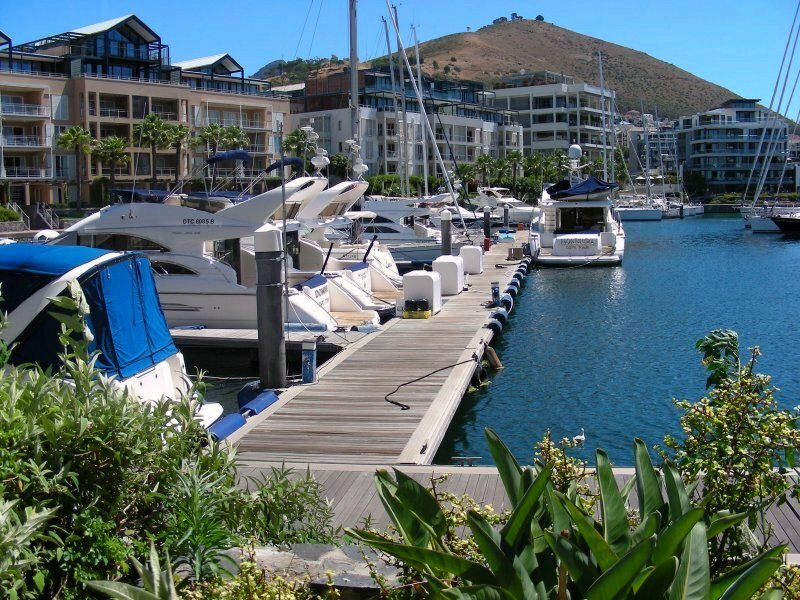 My eldest brother Edward and his wife were in town and so I was invited for New Year’s Eve dinner at their apartment at Cape Town’s V&A Waterfront Marina, along with some of their friends. 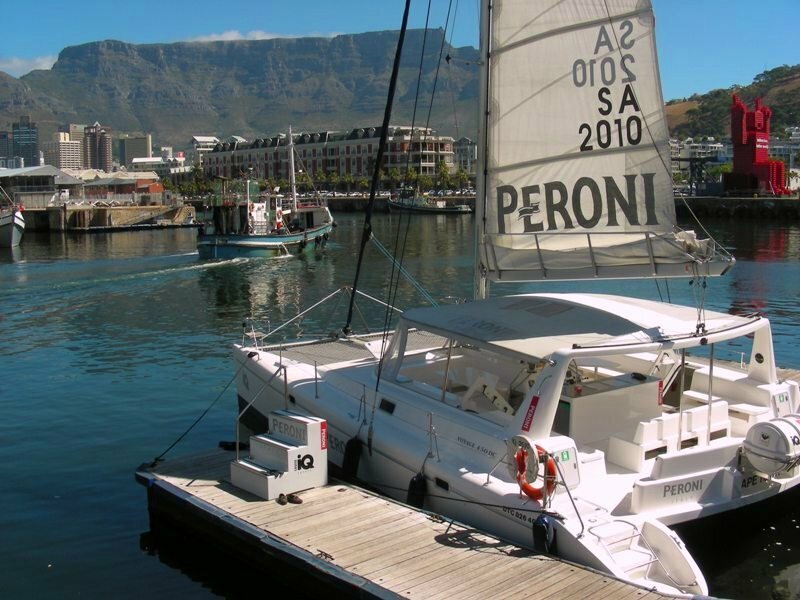 At around 10 in the evening, we headed off on the yacht belonging to Solly Heyns, a business friend from Johannesburg, to see out the old year and herald in 2014 in a unique and novel way, anchored off Granger Bay near the Cape Town football stadium, with an illuminated Table Mountain providing a spectacular backdrop. Some silence and tranquility might have enhanced the surreal experience, instead we had to endure the cacophony of insufferable techno music emanating from a multitude of New Year’s Eve party venues dotted along the shoreline. 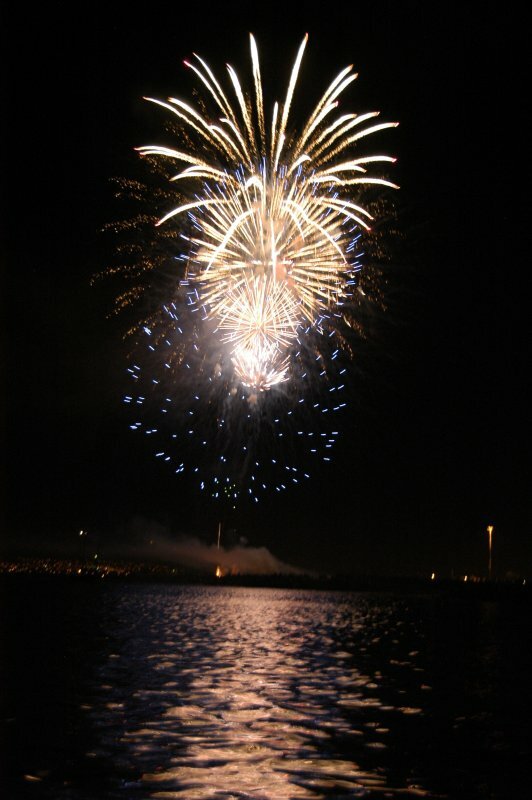 No complaints though regarding the spectacular fireworks display at midnight from the harbour breakwater. 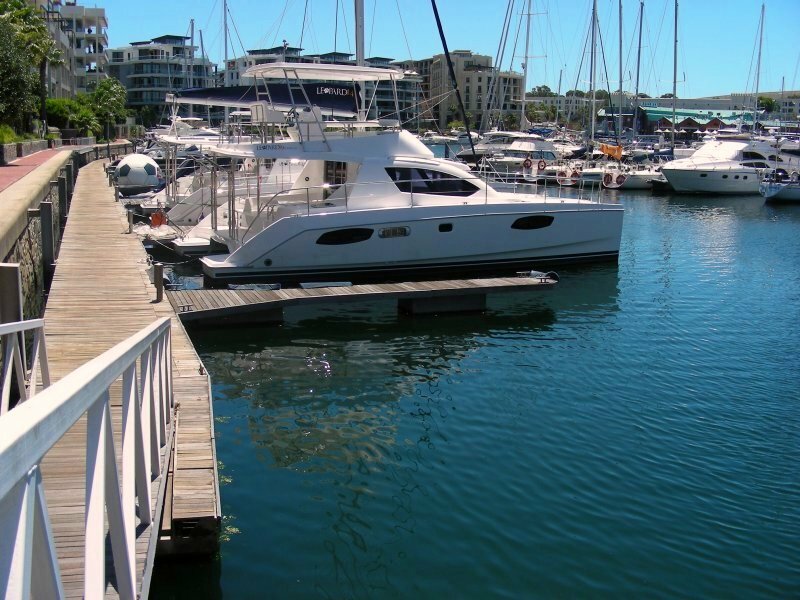 Owing to the number of party revellers at the V&A Waterfront until the early hours, quayside drawbridge opening times for boats were further limited, thus restricting access to the marina’s moorings and delaying our return. 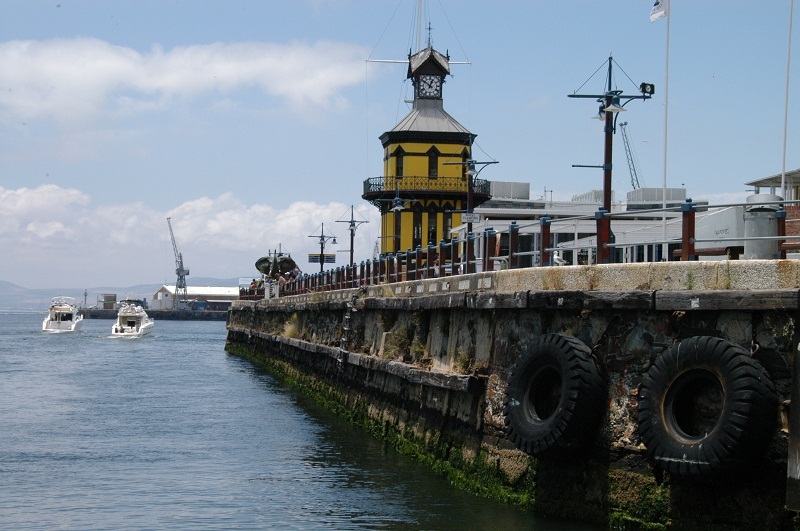 The V&A Waterfront’s famous clock-tower, Victoria Basin. 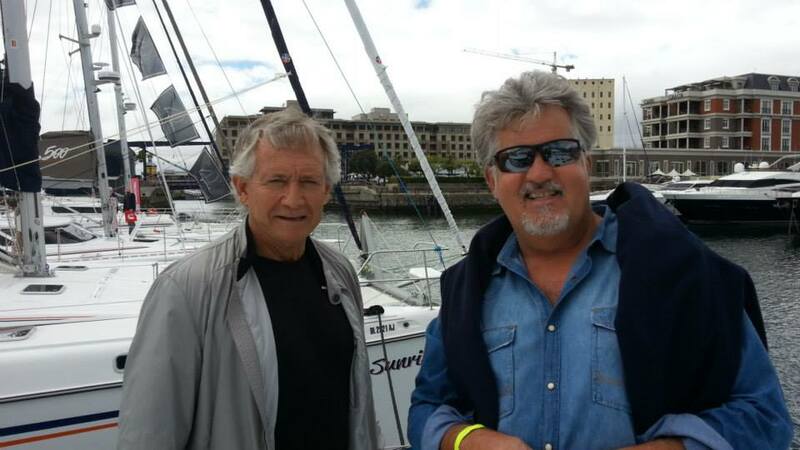 I was in for a another treat however when I heard that Ed & Solly were planning to follow the yachts at the the start of the 2014 Cape To Rio Yacht Race, annual event in the sailing calendar. 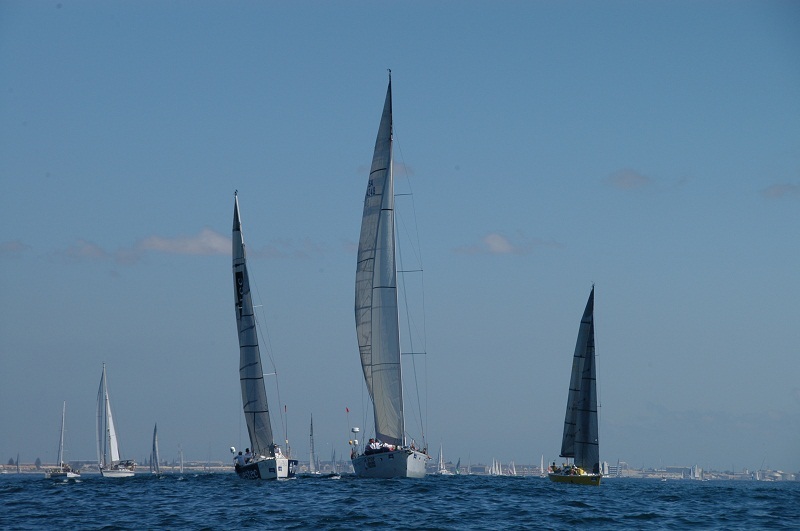 Thirty seven yachts were expected on the starting line with entries from Angola, Seychelles, Australia, America, Brazil and the United Kingdom. The day dawned with overcast skies but the cloud cover over the bay cleared as temperatures rose. 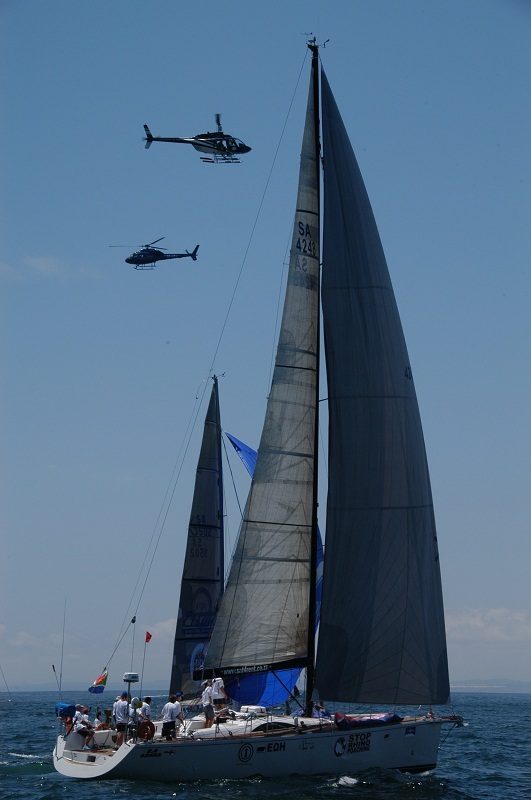 Once we had motored past the Victorian Gothic-style Clock Tower in Victoria Basin, constructed in 1882, which served as the original Port Captain’s Office and out beyond Table Bay Harbour breakwater, the bay was a hive of activity on the ocean as well as skywards, with a few helicopters occupying the airspace. 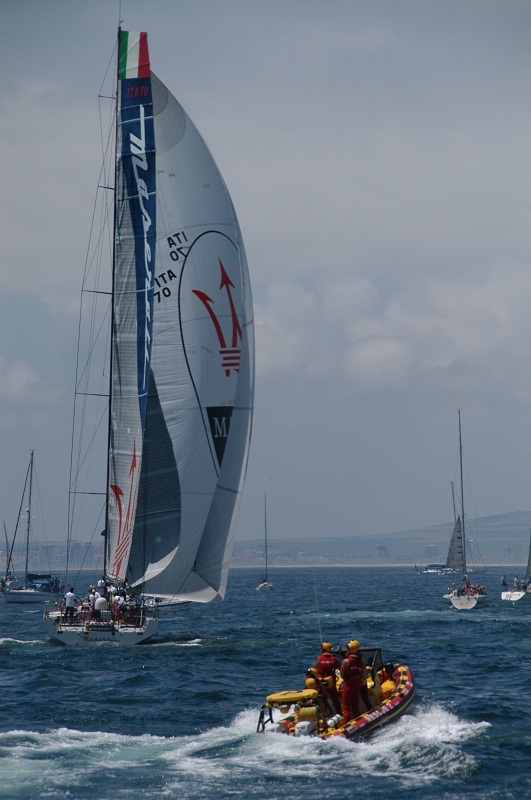 Maserati, eventual Cape To Rio 2014 winner. Scarlett Runner finished second overall. 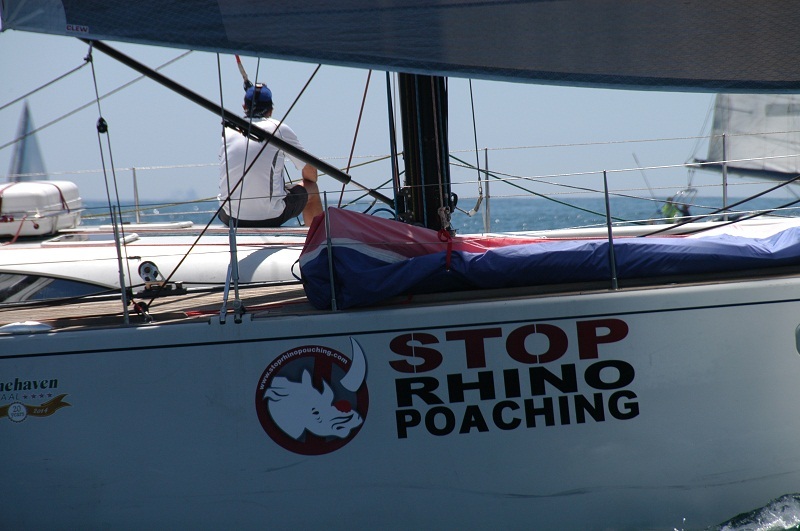 It was quite fitting from my personal perspective and interest that we should be tracking a yacht named Rocket/Stop Rhino Poaching. The slaughter of this animal is an emotive issue close to my heart. 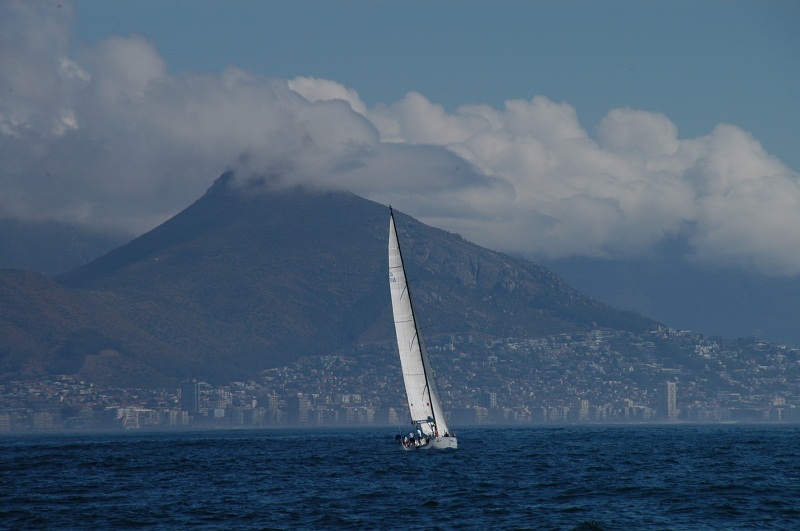 An acquaintance of the boat’s skipper or one of the crewmen was aboard Solly’s boat at his invitation, so we followed the Rio-bound vessel all the way down the coastline to Blouberg and after it had tacked, across towards Robben Island, where the swell was, well, nauseating. 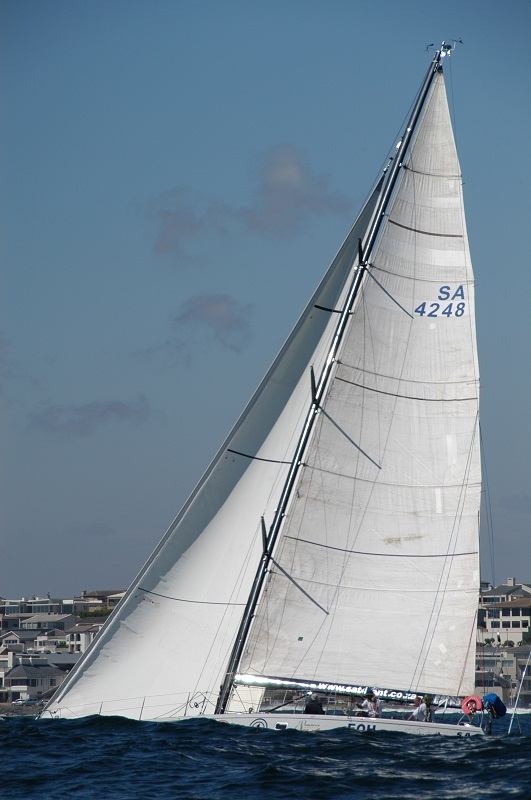 On one occasion prior to them setting the spinnaker, as we lay side by side in close proximity, the crew of Rocket/Stop Rhino Poaching waved at us, which in turn was reciprocated by yells of delight and encouragement from all on board. 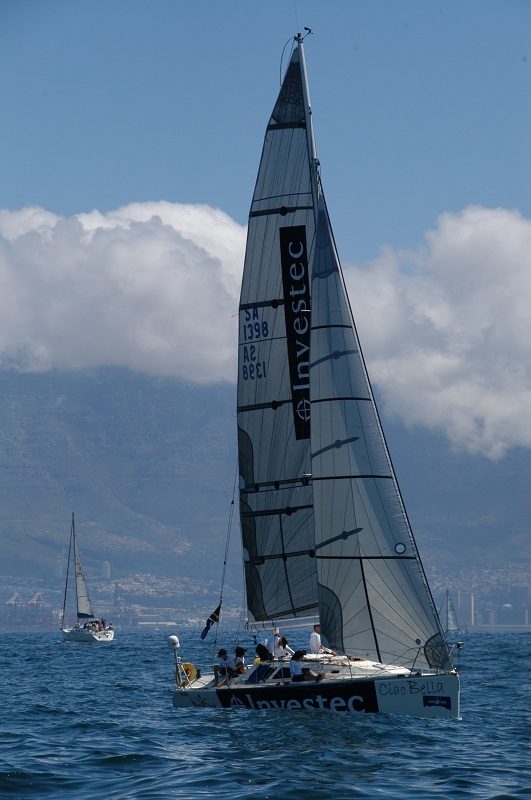 Table Bay, a hive of activity on race day. The fact that I was actively taking photos probably provided a welcome distraction from the way my stomach was feeling. I wasn’t alone. 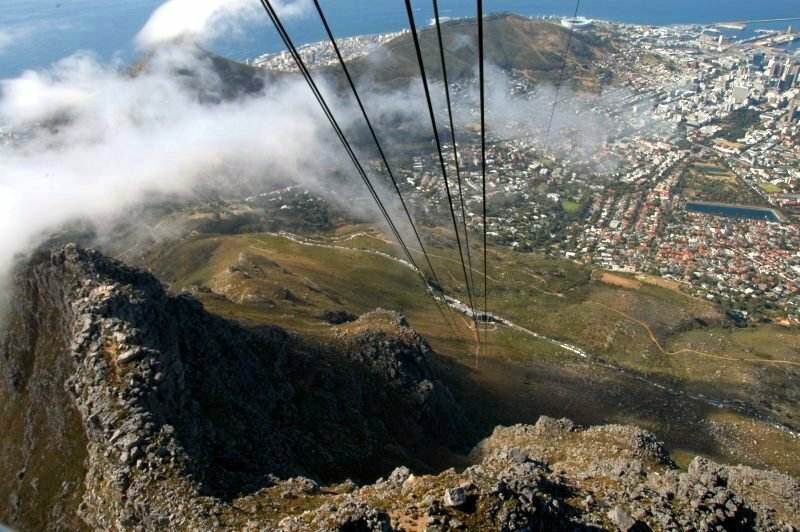 The views of Table Mountain capped by fluffy white clouds were breathtaking. 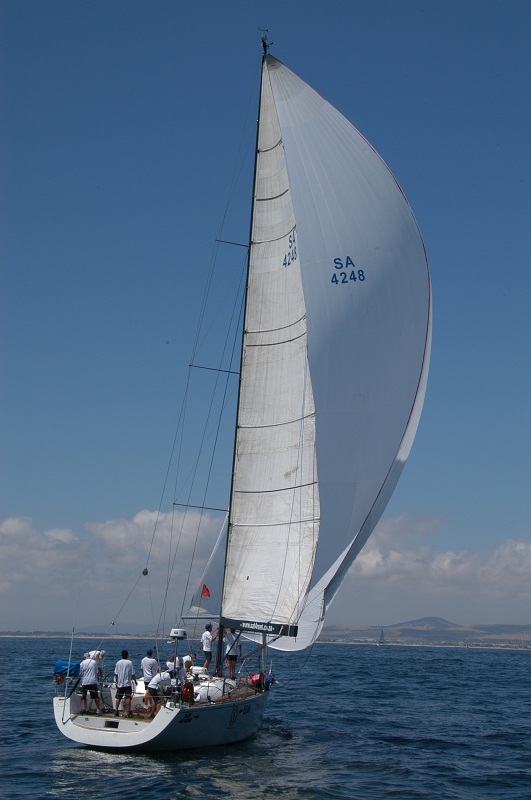 Solly considered rounding Robben Island however the sight of waves breaking further out at sea offered a cautionary warning. 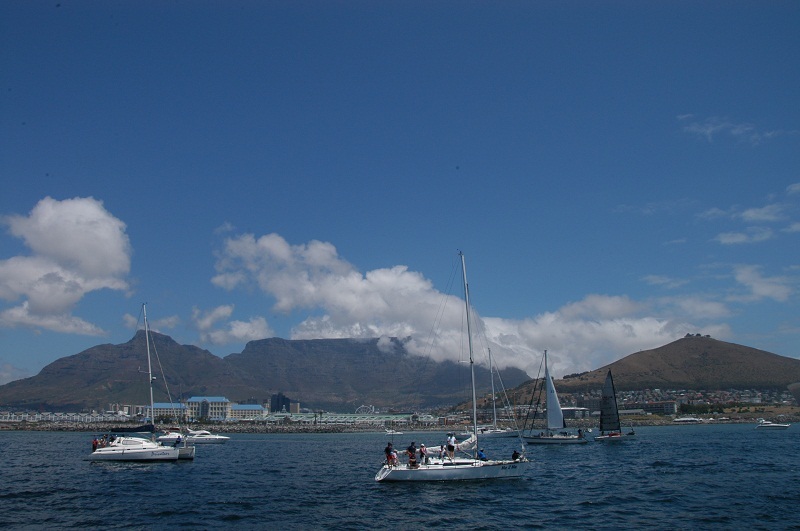 After about four to five hours at sea we returned to Table Bay Harbour. Sadly, the day ended on a downer. 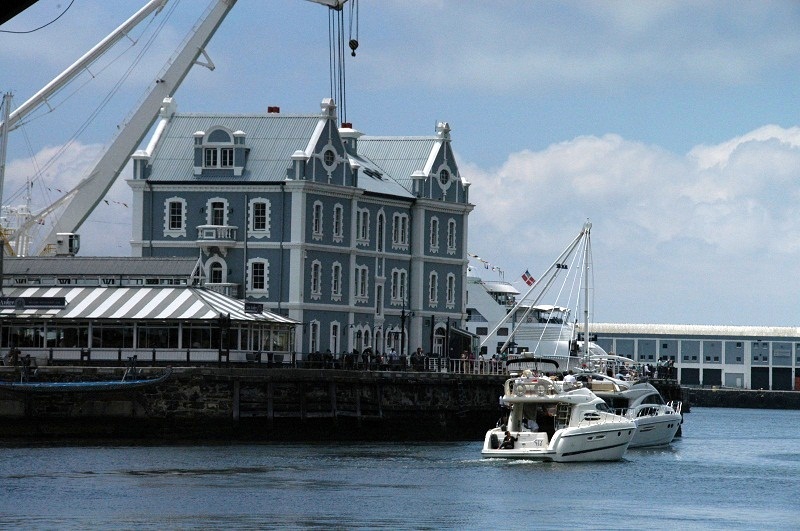 Severe tidal swells made entry to the V&A Waterfront marina really tricky, causing Solly’s boat to drift off course as we navigated via the bridge adjacent to the historic V&A Waterfront clock tower. Solly reversed engines and we made it through at the second attempt. 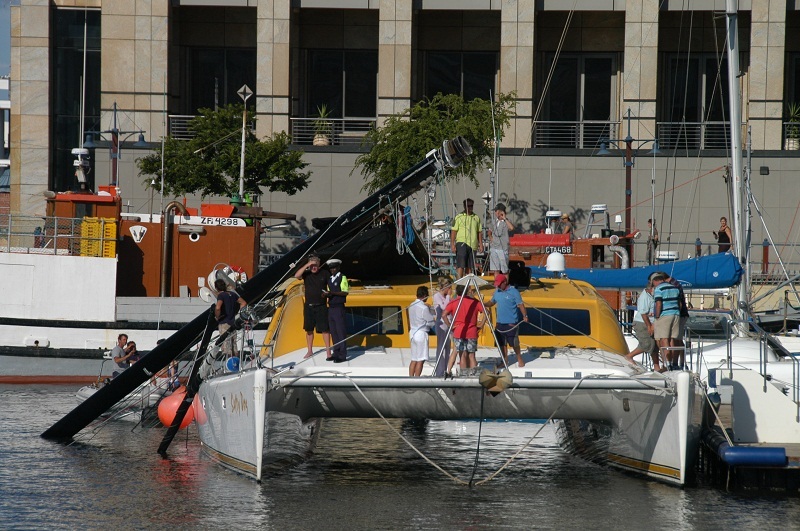 As catamaran Salty Dog attempted to navigate through the narrow channel just behind us at the drawbridge near the Cape Grace Hotel, one of the shrouds (pieces of standing rigging which hold the mast up from side to side on either side of a boat) caught on one of the raised drawbridges, causing the tensioned metal cable to snap with a loud bang, resulting in the huge mast toppling over, crashing onto the deck of the yacht. 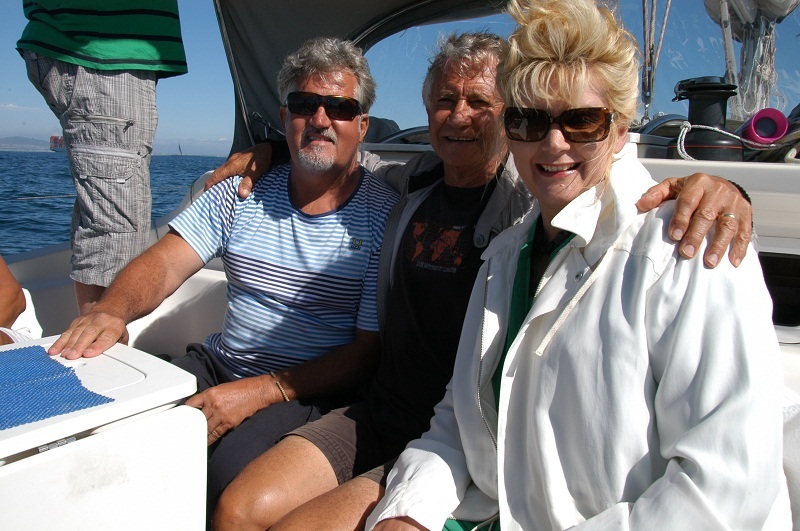 One couldn’t help but feel empathy for the skipper of Salty Dog. 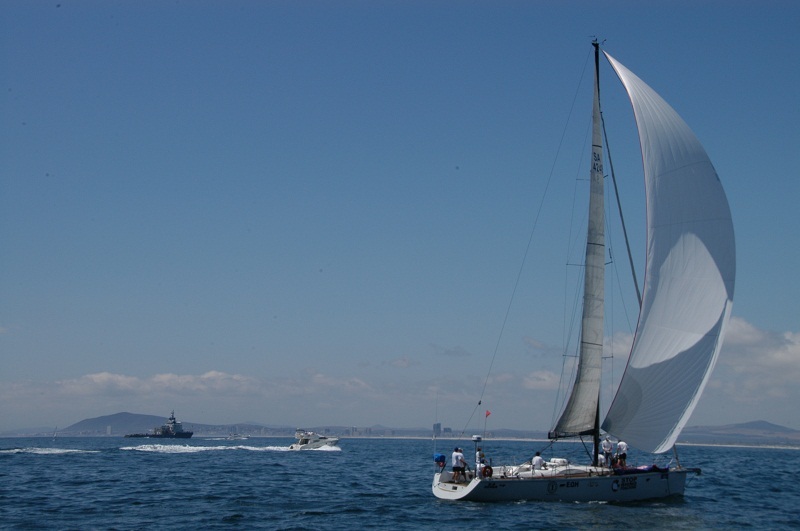 Rocket/Stop Rhino Poaching set the spinnaker ….. and they’re off! 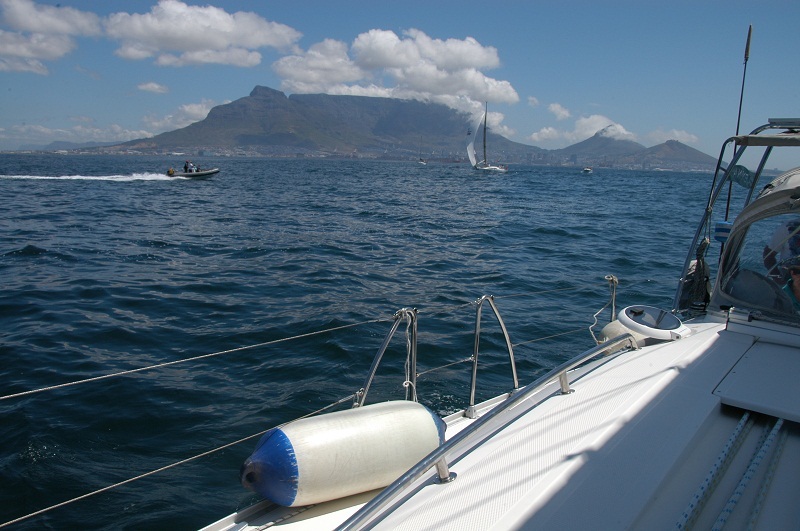 View of Table Mountain from Solly’s yacht. 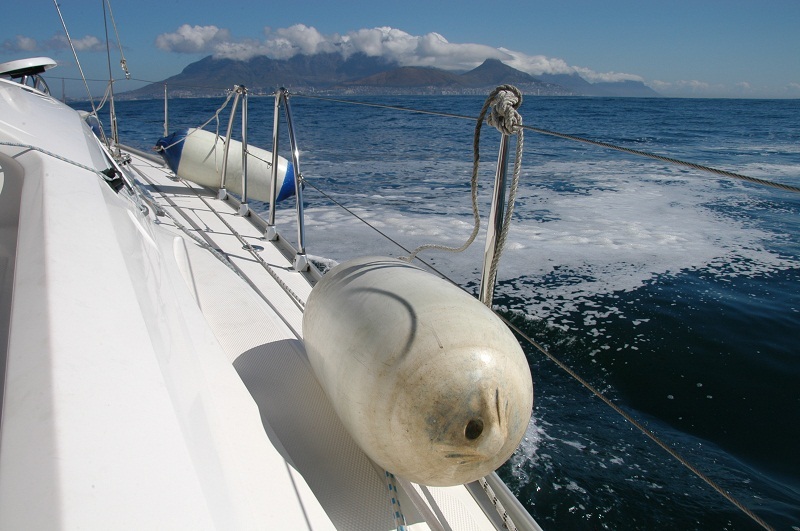 Further Cape To Rio drama was to unfold out at sea later that evening, when the Cape To Rio fleet ran into winds of up to 50 knots, with swells of 8 metres, about 100 nautical miles off the Cape coast. 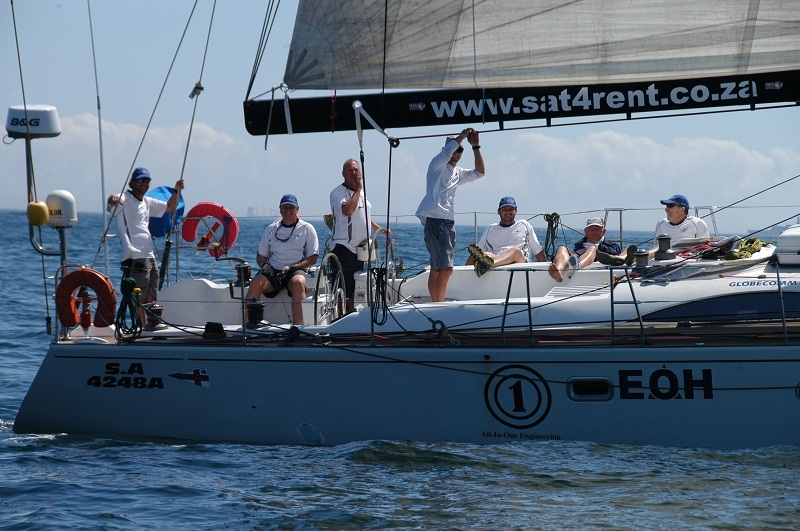 This led to a total of 10 yachts being knocked out of the race and returning to port. 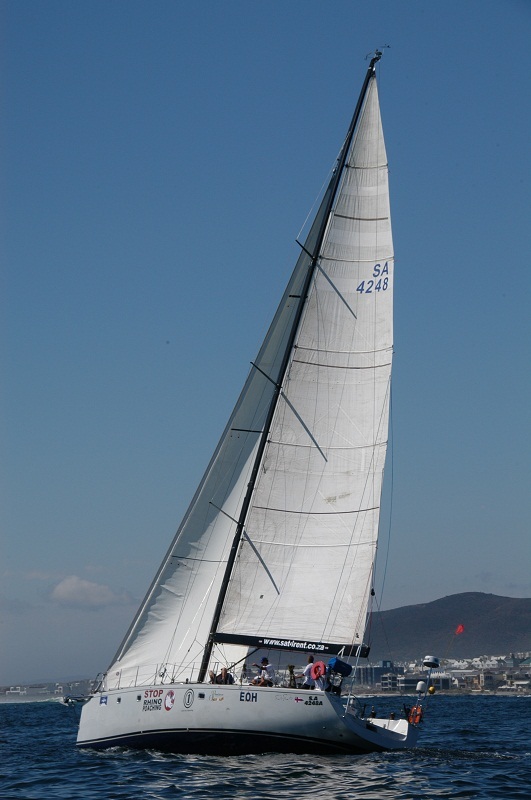 Angolan yacht Bavaria 54 Bille suffered a fatality when their yacht had dismasted. 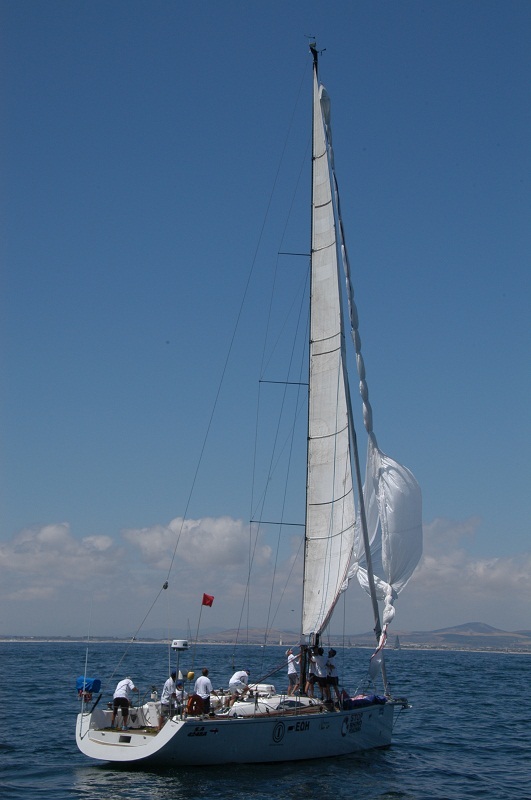 Rocket/Stop Rhino Poaching, the yacht we had been tracking at the start, survived the ordeal and continued on to Rio however a smaller race entry, Black Cat, whose skipper is known to Solly, were also towed back to port after their rudder sheered off, despite effecting makeshift repairs, as described in this revealing video. 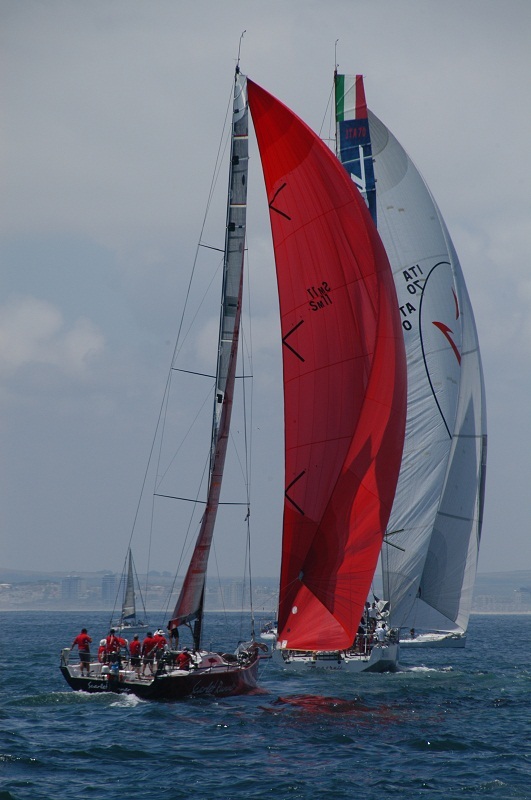 It probably came as no surprise that race favourite, Maserati, reached Rio de Janeiro more than four days ahead of second-placed yacht, Scarlet Runner, simultaneously shattering the course record, which has stood for 14 years. 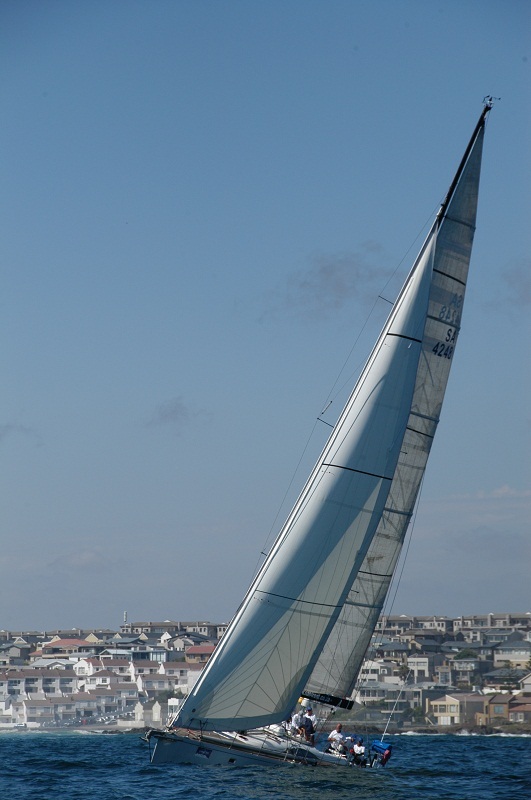 Completing the 3,300 mile course in 10 days, 11 hours, 29 minutes and 57 seconds. Maserati beat the previous record by over two days. 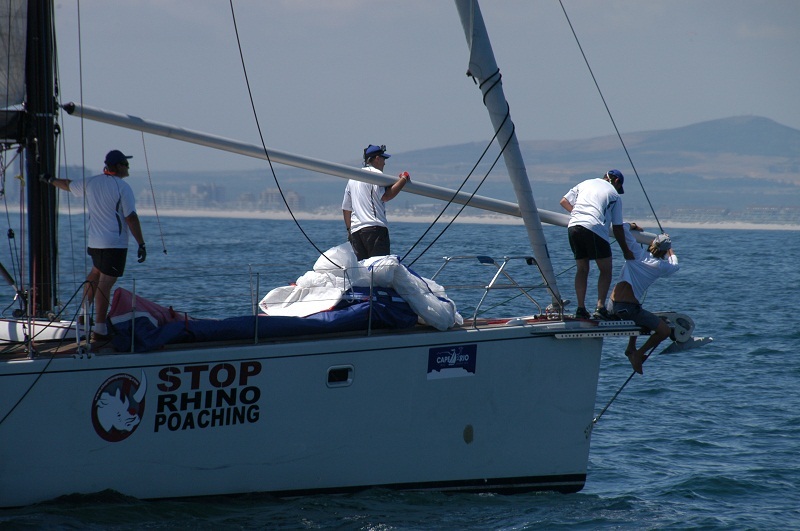 The yacht Rocket/Stop Rhino Poaching finished in 21 days 1 hour 57 minutes 22 and seconds in dramatic fashion in Rio, forced to tack 6 times against strong outgoing currents. Whilst enjoying the sunshine of the Fairest Cape, back in County Clare (where I work in the week) winter storms were battering the Irish coastline early in the New Year, particularly a little coastal town called Lahinch, which lies not far from Doolin, The Burren and the Cliffs of Moher, where I had walked [link] in the summer (see report and video). 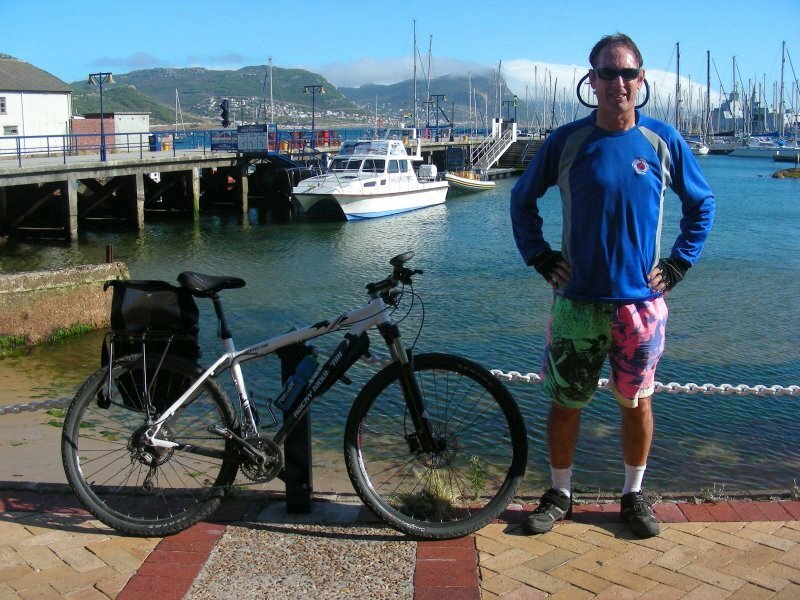 I was keen not to miss out on doing a spot of cycling whilst out on holiday, particularly somewhere along the Cape Peninsula. One of my brothers, John, arranged a road bicycle for my use and so two days before the start of the Cape To Rio, with my friend Ralph a more than willing participant, we drove out to Muizenberg early in the morning, pedalling off at an hour when the roads were still relatively devoid of holiday traffic. 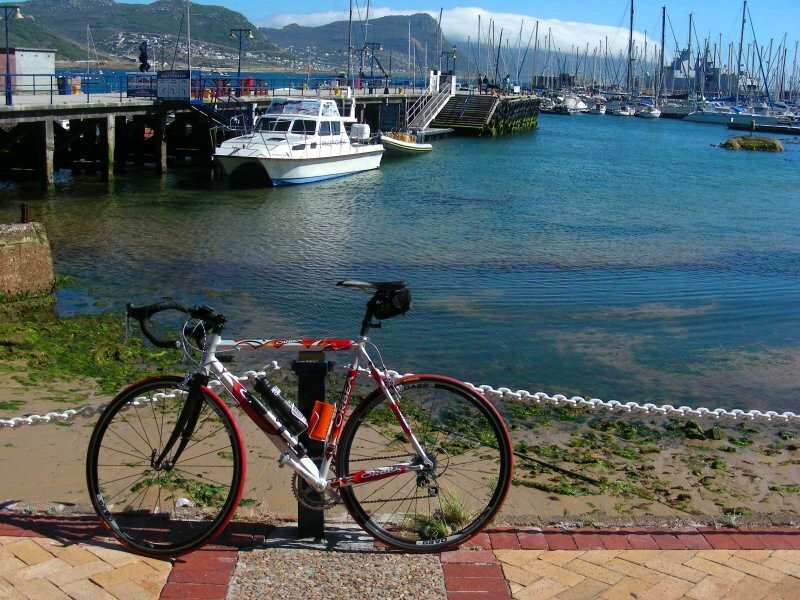 It was an exhilarating ride bringing back memories of the times when I had last taken part in the Cape Argus Cycle Tour some 13 years ago, an annual event in Cape Town that usually attracts more than 30,000 competitors. 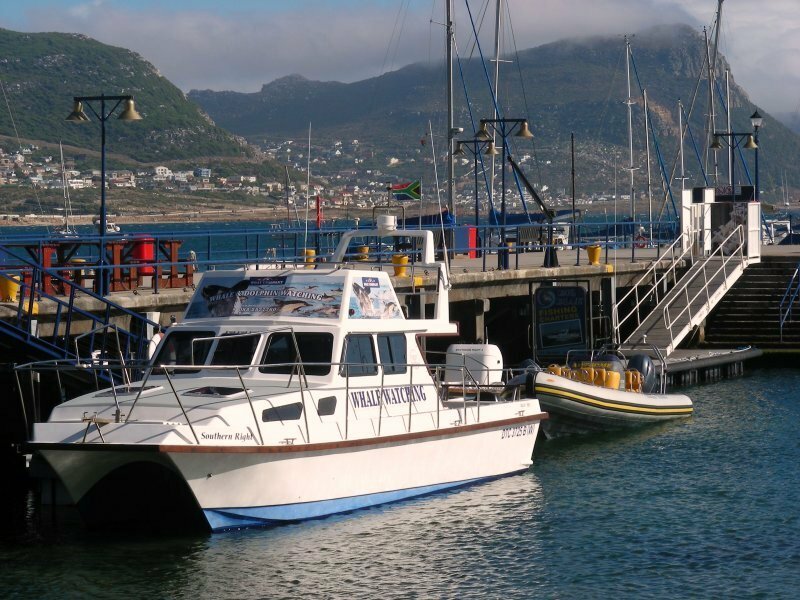 We were in no hurry whatsoever and stopped off in Simonstown for breakfast. 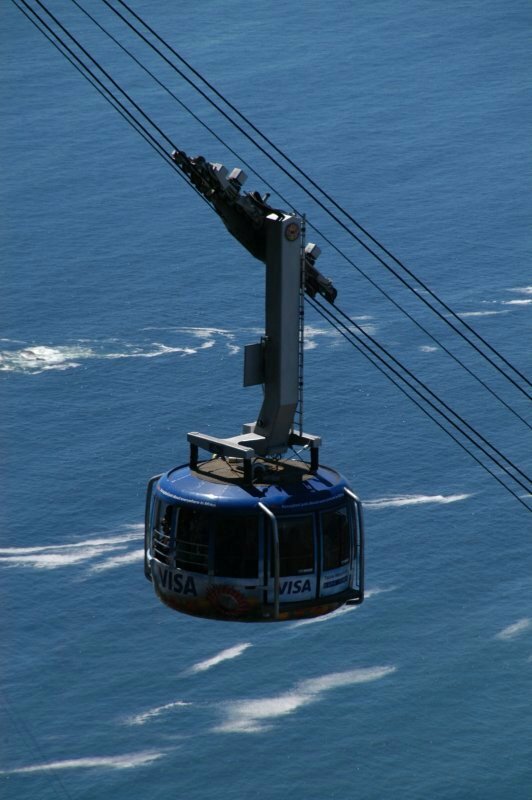 Continuing on the approach of Smitswinkel near Cape Point, the gears and chain began playing up on inclines. My saddle then collapsed, requiring adjustment after stopping. 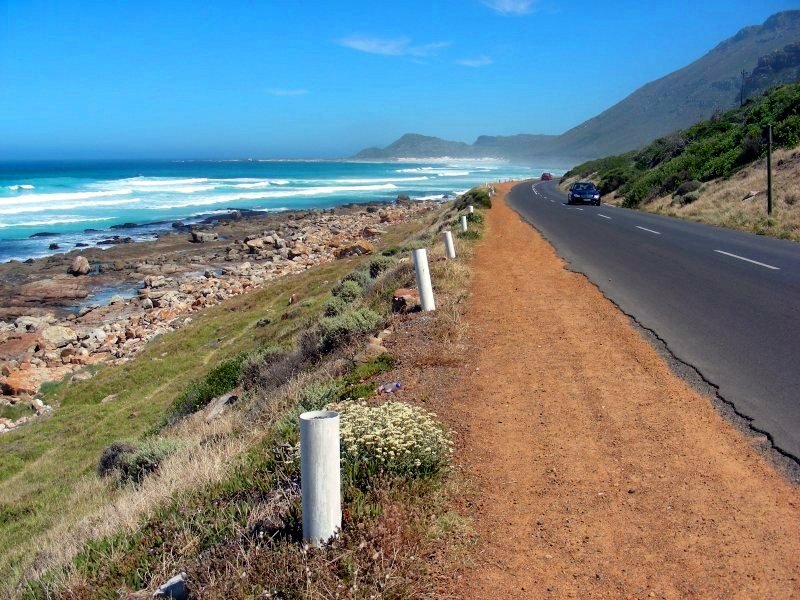 Still no traffic to speak of as we pressed on past through Scarborough and Misty Cliffs, one of my favourite stretches of Cape coastline, at Kommetjie, after navigating up an incline above Slangkop Lighthouse, we stopped to see if my cousins, Lorna and Giovanni, whom I had not seen in years, were home. Lorna can talk a hind leg off a donkey but with such an effervescent personality, this is easily forgiven, as she is also one of the kindest people I know. What a coincidence that my eldest brother, Edward, arrived to pick up a consignment of crayfish (lobster) from the cousins, an annual ritual performed whenever he is in Cape Town, as he is besotted with the stuff. The tiny seaside village is renowned for it. 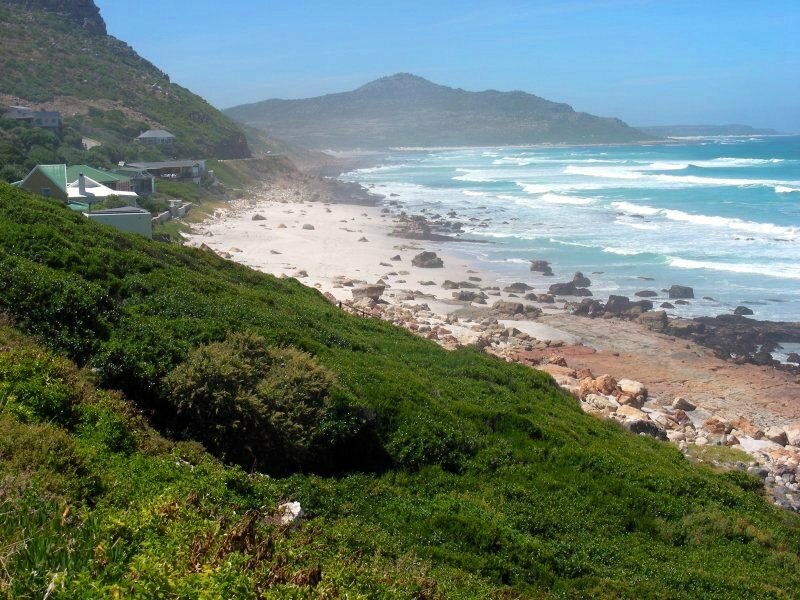 Away from the coastline, the cycle back through Ocean View to Fish Hoek proved far less interesting however. With the onset of the lunch hour, Ralph had developed renewed hunger pangs and seemed fixated on having a Spur burger. It has been years since I had last been inside one of these restaurant outlets. 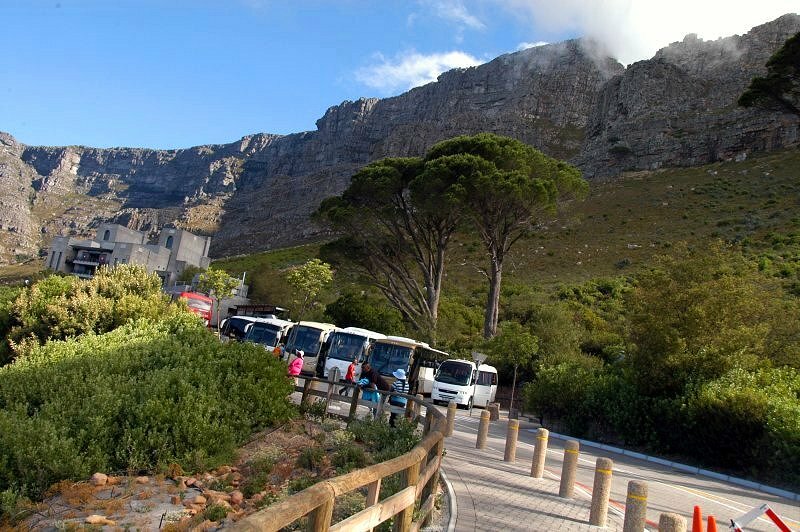 On the short journey back to Muizenberg, the roads were by now jam-packed with holidaymakers on the move. 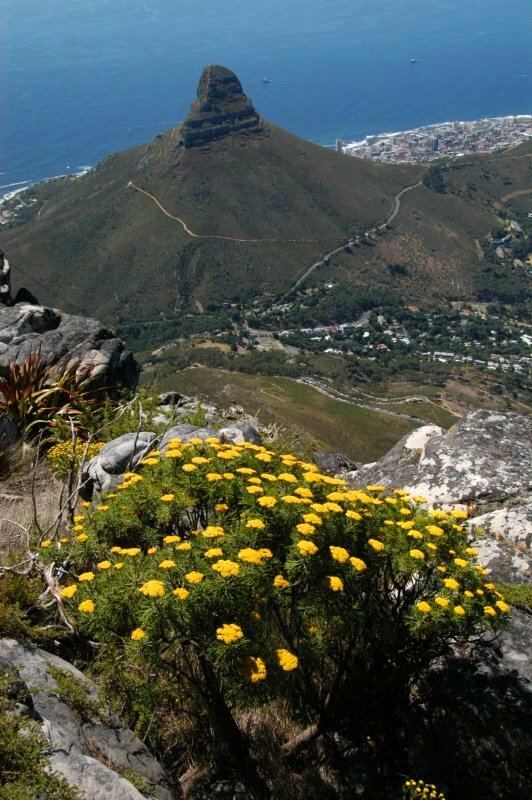 Personally, a visit to Cape Town is not complete without a walk up the path to Elephant’s Eye in the Tokai Arboretum followed by a visit to my dear friends and backside neighbours Ian and Lily (as my Tokai home is located in the street behind theirs), however it was a slog up Platteklip Gorge, a virtual stairway leading up the face of Table Mountain, the start located along Tafelberg Road. I had just completed four days walking in the Cederberg, yet I somehow found myself devoid of all strength, stamina and energy. 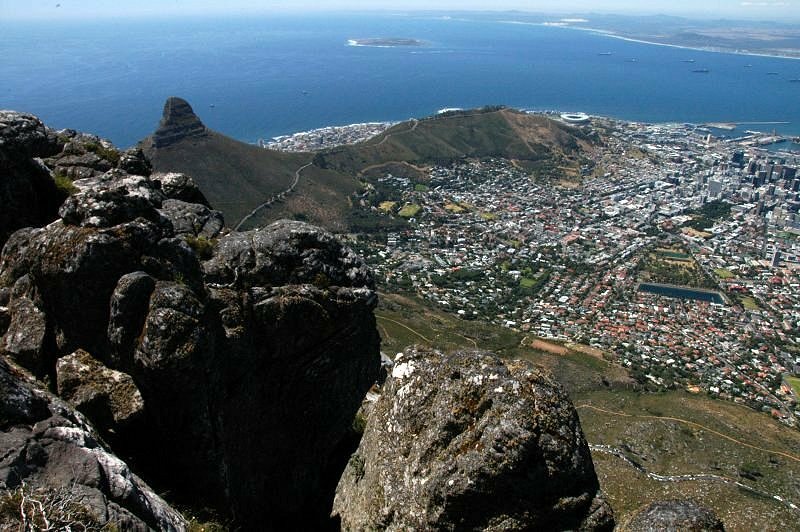 Prior to following the jeep track from where I’d left my car at the turn-off off Kloof Nek Road, I met some out-of-towners including two gorgeous leggy Ukranian blondes in shorts, who were unsure of the route to the start of the climb. 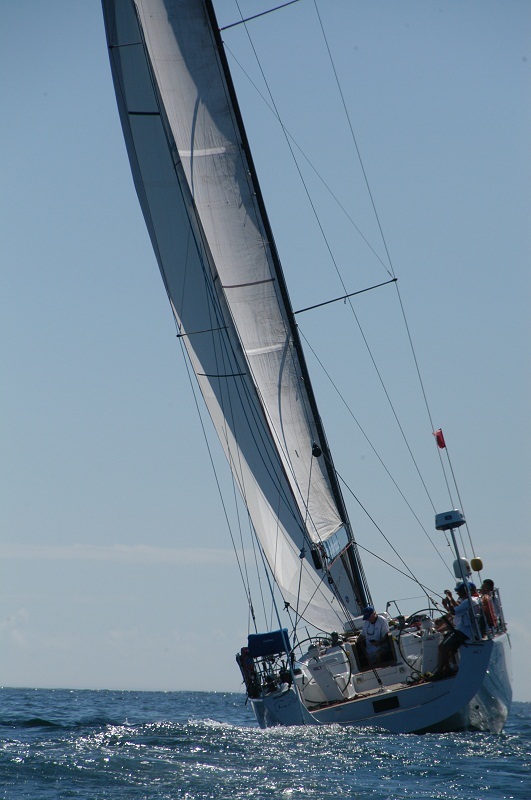 Sadly, even the thought of trailing behind them for a few hours could not motivate me sufficiently to keep up. I never saw them again. 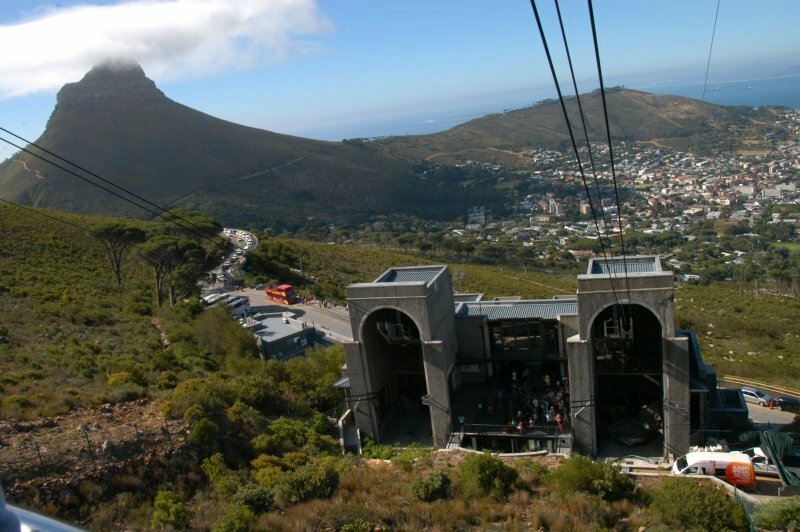 The plan (on this occasion) has always been to take the cableway down, which involved standing in a queue for about an hour. This I did not mind but I took exception to the sheer arrogance group of locals, as I located the rear of the queue. With my having just joined the line behind a youngster, a good few minutes later, they appeared out of nowhere, proceeding to push in front of me, all eight of them, without any word of apology, purely on the basis that, as they happened to know the young lad, it was their inalienable right to do so. 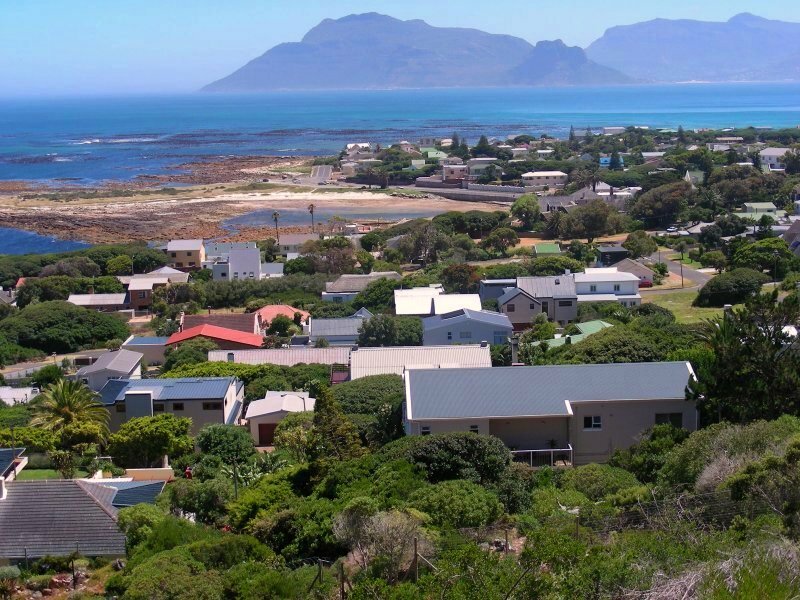 I spent an inordinate amount of time fuming, whilst been drawn into a moment of cognitive bias, convinced that these moegoes (stupid people) were either Transvaalers from the bad side of town or arguably, residents of Kraaifontein, a middle-class suburb of Cape Town. 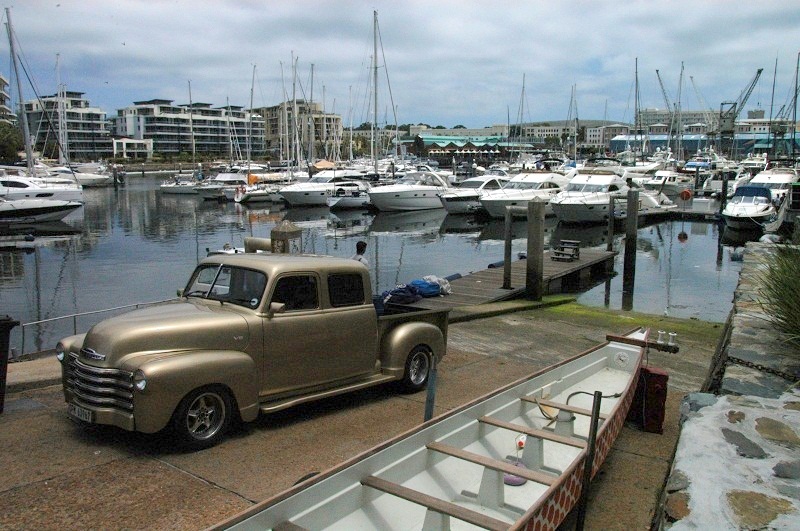 Having said that, I was had a girlfriend from Kraaifontein and I was rather fond of her! Amidst all this physical activity, I ensured I spent quality time with my three elder brothers, whilst lazing around my boet Gordon’s pool sipping Savanna, a deliciously more-ish, dry South African cider, joyfully watching the visiting Indian Test cricket team leaving our shores with their tails between their legs, having paid the price for arrogantly attempting to dictate the tour agenda, not only by refusing to play the four planned Tests in South Africa, but by also insisting on the actual venues for the only two Test matches that were eventually played. That South Africa won the series and retain its position as the number 1 test side in the world, seemed a just reward. If the first Test at a deserted Wanderers saw South Africa chicken out of setting a world record for a run-chase score in a cricket Test, the second game at a predictably rain-affected Kingsmead in Durban proved to be the swansong of arguably South Africa’s greatest cricketer, Jacques Kallis. After dwelling on the issue for some while, with so many potential choices, I finally came to a decision to make a donation to OSCAP (Outraged South Africans Against Poaching), having been connected on Facebook to the organisation’s director, Alison Thomson. The rhino poaching stats for 2014, already at 65 slaughtered, bear witness to the crises that prevails. 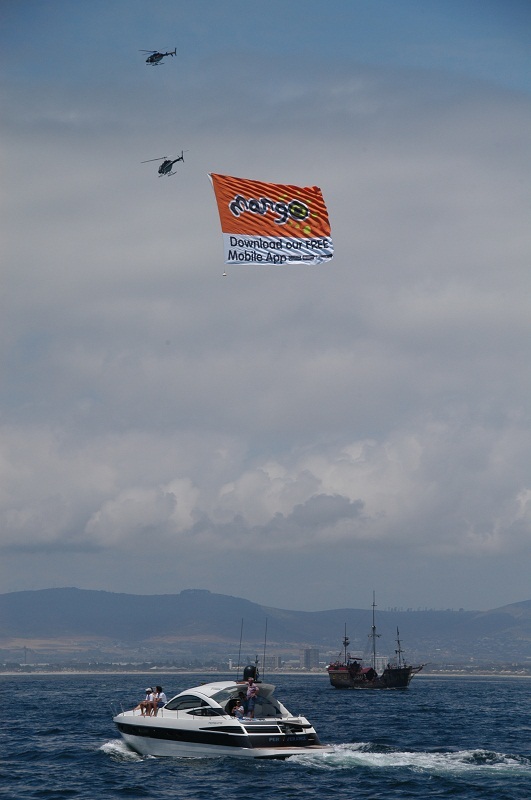 My feeling is that we as South Africans don’t take it seriously enough. 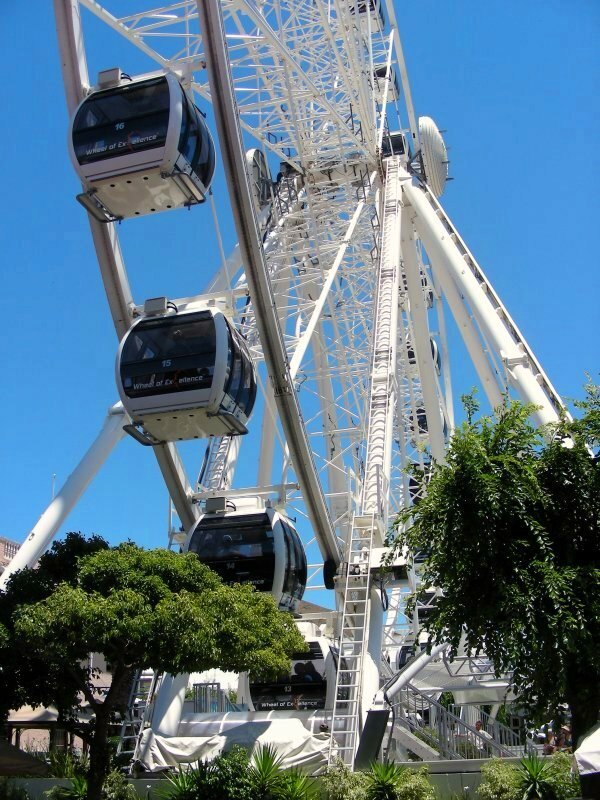 We stand to lose a vital asset that contributes much to the country’s tourism and heritage. My visit coincided not only with the funeral of Nelson Mandela but also with several incidents characterizing the ineptitude of the incumbent president, Jacob Zuma. Not only did he endure the humility of being roundly jeered at the memorial service to Nelson Mandela at the FNB Stadium but has another scandal to deal with, not that he seems too bothered about it. 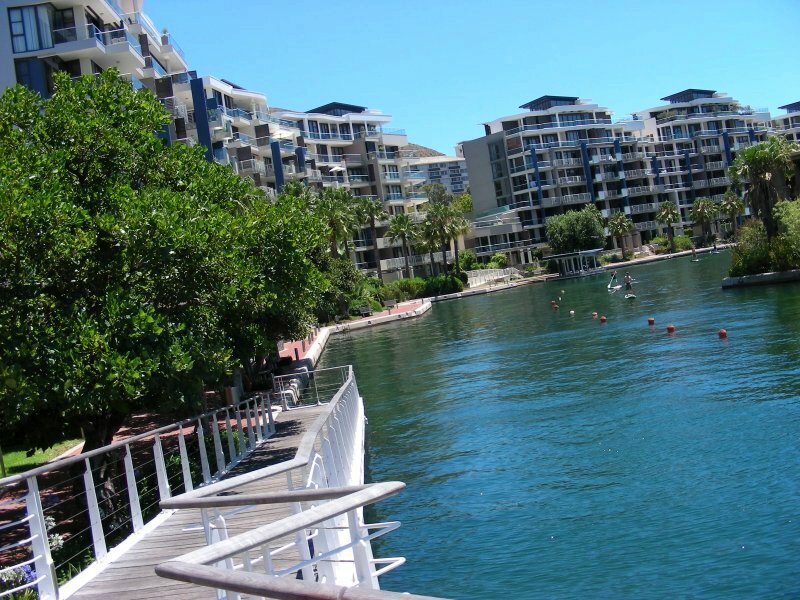 Nkandlagate, as I call it, is the prevailing controversy surrounding the R200-million of South African taxpayer funds being spent on his private residence in Kwazulu in Natal. Over the Xmas period, newspaper reports had a field day, eagerly suggesting design flaws exist in the supposed chimney on the roof of one of the main structures of the compound is, in short, too short. Democratic Alliance leader Helen Zille has stressed the need for South Africans to register and vote (see video clip). South Africans abroad have now for the first time been able to register for elections, due to take place in 2014. 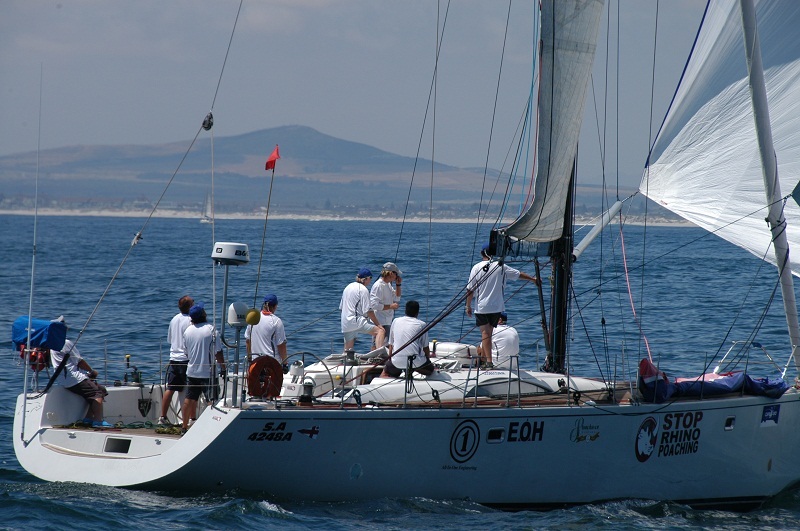 The registration process will close on 7 February 2014 at 17h00. There is a view that South Africans who emigrated around the time of political transition to democracy are now returning in numbers. 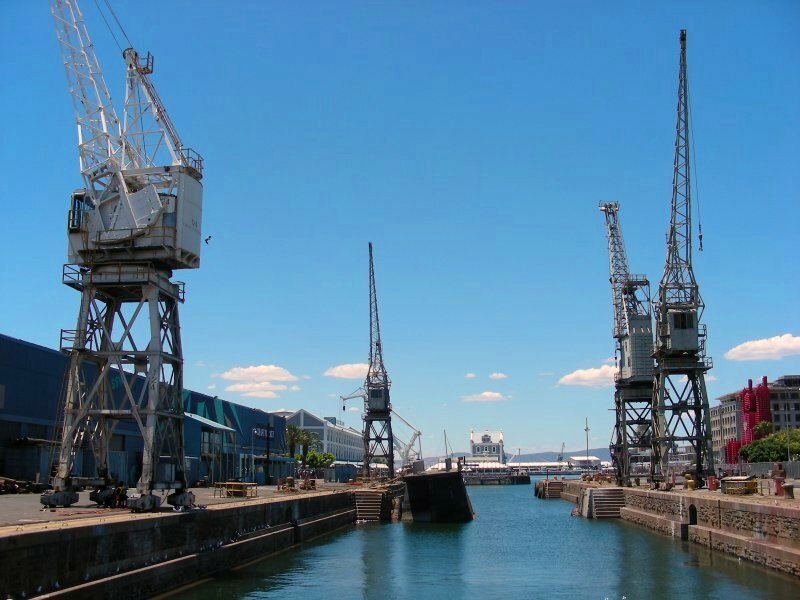 An estimated 359 000 high-skilled South Africans who have returned since 2008 and have been absorbed into the labour force, it is claimed (see article). 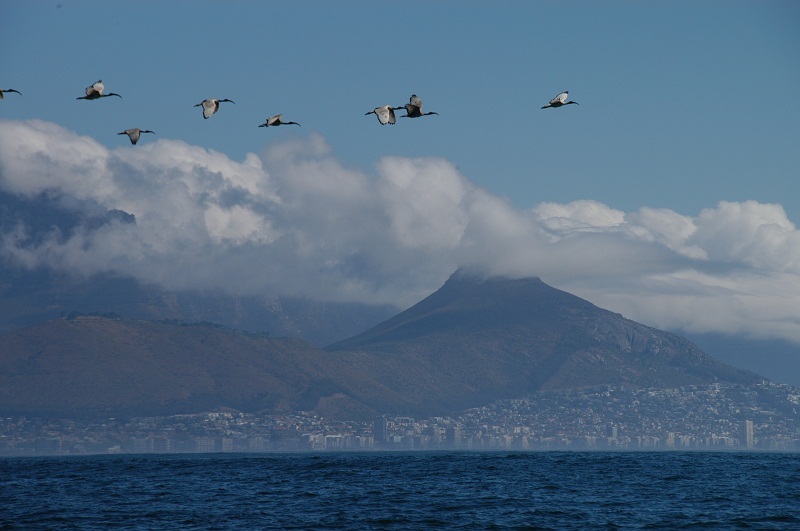 Each year that I return to the fairest Cape, it becomes harder to leave. 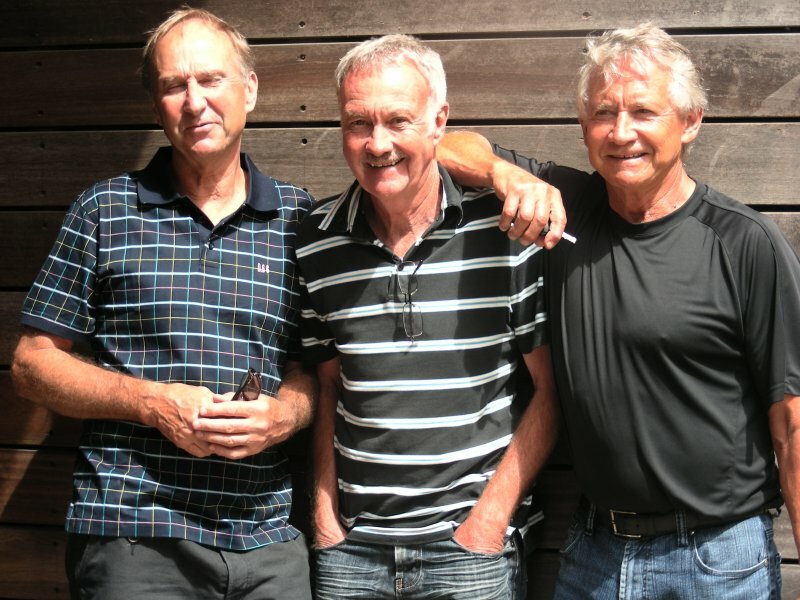 The “three musketeers” I care about very much came to see me off at Cape Town Airport, not without emotion, naturally. Perhaps the time has come for me to return for good. Perhaps I have become too soft and idealistic in my existence abroad and that the reality of every-day life in South Africa will, in time, harden me (see this excellent blog) however to borrow an old cliché, originally coined for use in a derogatory context, you can take a South African out of the bush but you can’t take the bush out of a South African. I believe there’s another positive spin when interpreting the phrase; my spell in the Cederberg illustrated this. Once you’ve slept under an African sky at night out in the open in God’s country, gazing at the stars, it leaves an idelible mark. In truth, the African bush never leaves you. It’s ingrained in the soul.